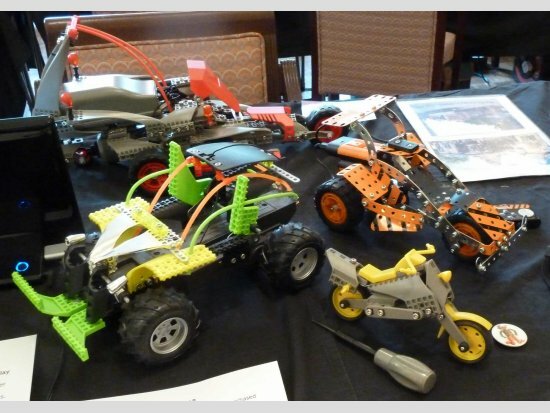 The 95th meeting was well attended with many superb models. Unfortunately neither of our regular model reporters was able to make the meeting and so your editor had to step up. I knew it to be a difficult job but just how hard it is, was apparent at this busy meeting. Getting round everyone was not easy and the task is made more difficult where models are not identified. I apologise for any I have missed. Many pictures will be found on the website (nzmeccano.com) thanks to Bob Thompson who spent most of the meeting taking photographs. I am really grateful for all those who have sent me emails and provided written descriptions which I hope I have done justice to in this report. At this meeting we held the AGM but to save valuable bulletin space we will not include a full written report, this can be found on the website. A summary of the main decisions is on page 22. 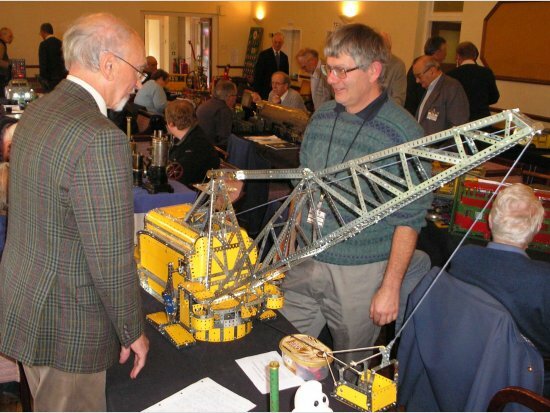 The model of the day for me was Terry Wilkes’ dragline (shown above) which he has built within a No.10 set except for a few minor parts and extra nuts and bolts. The dragline is shown on the covers of the new main set manuals introduced in 1954 replacing the famous block-setting crane. No instructions were ever issued for the model but Jim Gamble managed to rescue some original photographs from the factory and these were used by Ian Stoney to rebuild the model and produce Model plan 87( still available from MWMO). Ian’s rebuild requires considerably more parts than in a No10 set and without being critical has a complex set of mechanisms. Terry’s model is very true to the cover model but uses four power-drive motors, simplifying the gearing to the operational functions of the dragline: bucket lift and drag, boom elevation, slew and walk. Terry demonstrated that the model works very well, including walking. The motors and 8 x part no 90a and 10 x part no23 are the only extra parts (to a 1970’s set 10) of significance. We hope to be able to provide detailed building instructions for this model in future bulletins. I began my tour of the models with Mick Burgess who I know usually leaves early and is often missed. He had set up four small models on the piano including a model of the clockwork 4-6-2 Pacific tank loco from the 1929 MM built in very nice blue/gold livery ( very hard to get these days) and an example of a modern “DIY metal construction model kit” , which builds four styles of model, and showed a JCB type digger (not Meccano as we know it). Alan Covel, who always builds on a human scale had turned out a motorised tricycle two man 1912 fire engine. His model was almost full size but power was supplied by Alan’s legs alone. Tony Wakefield showed us his Austin Healey 3000 still in development but looking very well proportioned using the ‘skeleton’ strip approach seen in his Mini. 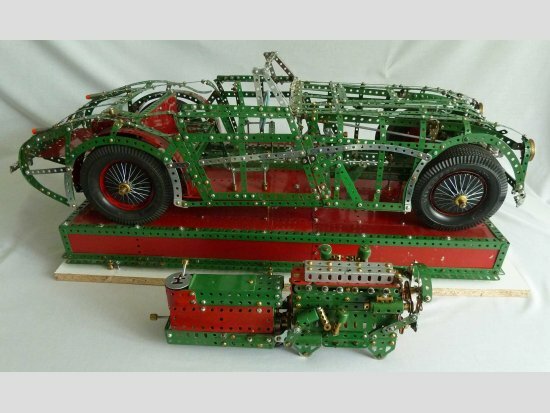 It is similar to another Meccano Austin Healey 3000, built by Les Megget (New Zealand), which appeared in a recent edition of the Sheffield Meccano Guild Journal No. 120 June 2014 P28-31. Scaled 4.5:1, using a diecast model as a guide and drawings from the AH website, the model includes a wealth of detail: steering gear, suspension and a removable engine and gearbox which enables the detail of the driver/passenger area to be seen. 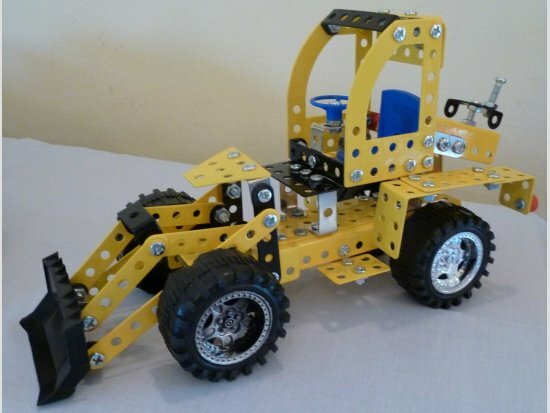 New member Paul Merrick had a very neatly completed JCB Loadall possibly based on a model plan. John Hornsby, Richard Payn and Geoff Burgess were in the Scammell corner admiring Geoff’s Scammell mountaineer. Now these models are far too complex for me to describe so Geoff has supplied a detailed account of his model with pictures both of which I intend to feature in the next issue. Details will also be featured in CQ. Here is Geoff’s introduction to the model: “The Scammell ‘Mountaineer’ was a vehicle produced post WW2, and followed on from the Scammell Pioneer used as gun tractors and tank transporters throughout WW2. Intended mainly for civilian heavy haulage, it was powered by either, Meadows, Gardner or latterly Leyland diesel engines, had four-wheel drive, and could be fitted with a winch. I have modelled a version fitted with a crew cab and a vertical spindle winch. As usual the diameter of the available wheels set the scale, in this case ashtray tyres with a diameter of 6”. To arrive at the models dimensions I used my usual method of numerous photos of the prototype downloaded from the internet and some scale technical drawings kindly sent to me by John Hornsby. I measure the whole vehicle in wheel diameters or fractions thereof, transferring these measurements into ashtray tyres, this method does not of course give an accurate scale model but does give what I feel is a model of acceptable proportions.” In addition to the Clutch, Gear box, Winch and double reduction differential units operating in a similar manner to the original vehicles, a lever next to the winch operators seat operates the main engine clutch. Brakes are operated by both foot pedal and hand lever. Geoff has used novel approaches to realise these functions and created a model with lots of detail that certainly gives it the feel of the real thing. More details will appear in the next bulletin. 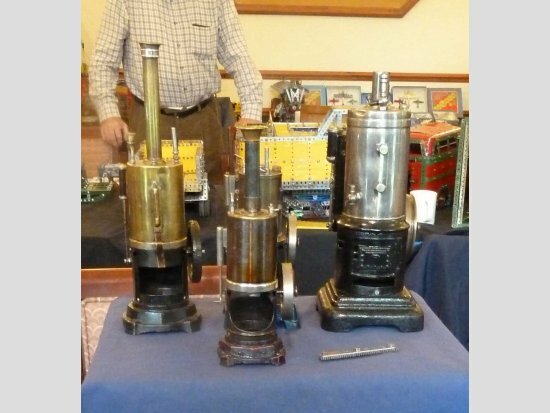 Howard Somerville showed his 1895 Davy Hathorn Horizontal Tandem compound pumping engine which we saw at Skegness and was described in the last bulletin. have had a long wait!” The model is built to a scale of 1:5 and includes the following features: 3 speed and reverse gearbox with foot operated clutch and prop shaft to rear axle differential; Lights, scuttle ventilators, trafficators and windscreen wipers all operated by switches on dashboard; Foot brake and brake cables to all four wheels. Terry states “The chassis construction was reasonably straightforward being built off the scale drawings obtained from The Bugatti Club. 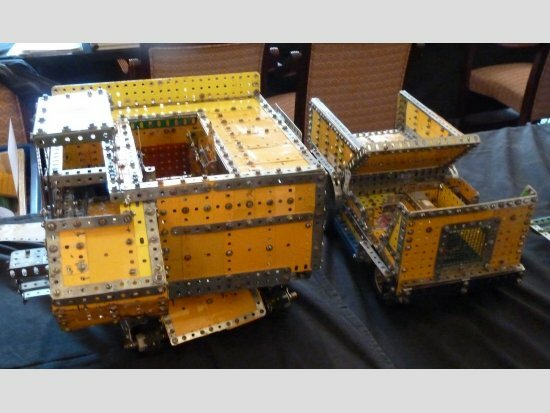 The completed chassis plus ancillaries was designed to be a model in its own right should I find that the various constructional problems of the bodywork proved beyond my ability to solve. 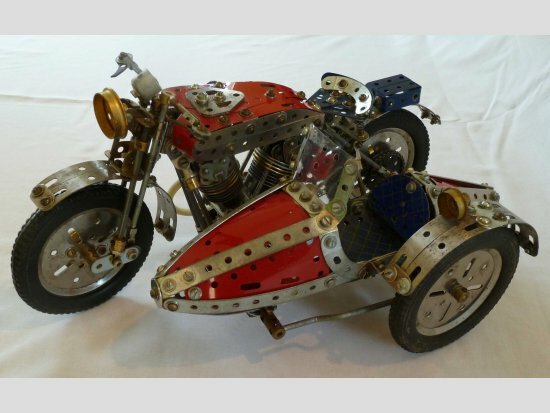 The finished model testifies that it was possible to complete the bodywork, but not without taking certain liberties with some of the parts. During the shaping of the bodywork I found that the two dimensional drawings were not much help in forming the various contours and I found the 1/24 scale model provided the answers. I have enjoyed building this model (well most of it!) 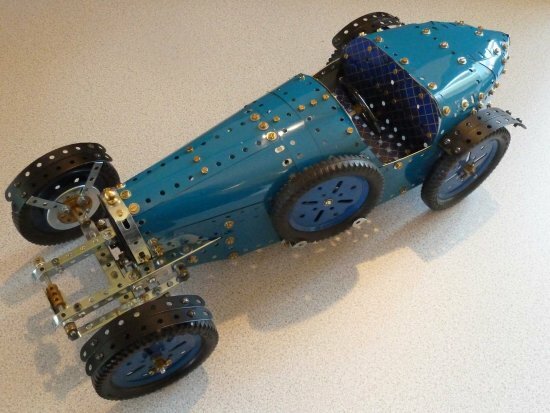 and especially the interest and encouragement of my fellow Meccano builders over the long building process.” I am sure the Bugatti club agree the wait was worth it! (Editor). 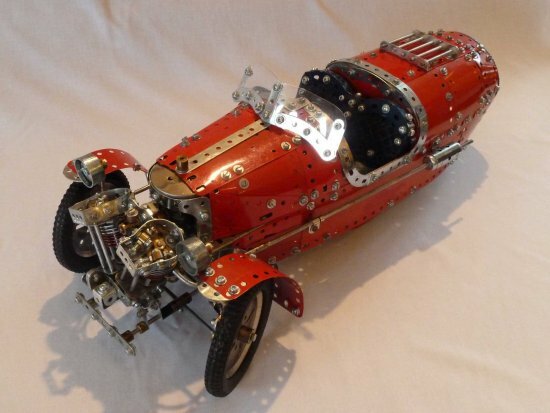 Still on the Bugatti theme your secretary (Roger Marriott) bought along a rather more elementary model of a Bugatti type 35 copied from a model shown by Richard Smith at Henley. John Hornsby kindly sent me a picture of the real thing that he was lucky enough to get to sit in. 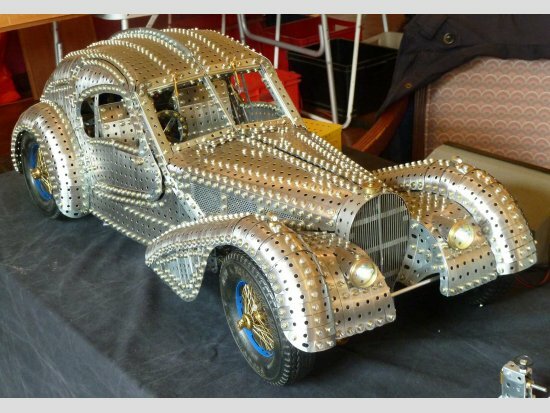 My Bugatti does not as yet have any mechanics apart from steering. Chairman George Illingworth’s model (no prizes for guessing) the familiar 1957 Dennis water tender, bought back memories of these well-proportioned appliances and also to me of building the No. 5 set manual model of the fire engine in about 1960. Parked beside George’s appliance is my Bugatti. 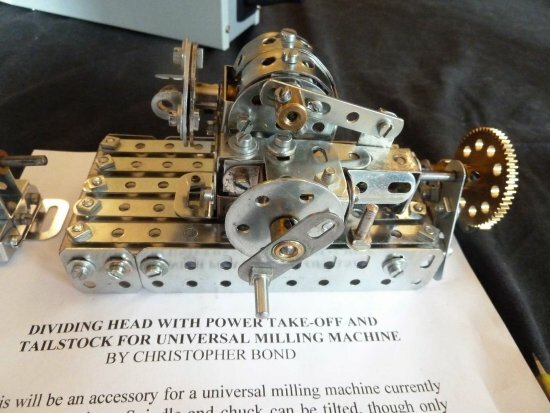 is building a universal milling machine and had brought along a neatly made dividing head for the machine. 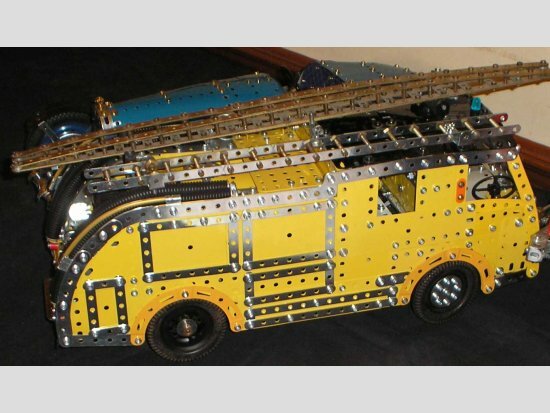 Chris reported “as so often in Meccano, it’s a compromise between reasonably authentic appearance and functionality. Prototypically the spindle drive would normally be by a worm and 40-tooth worm-wheel. This would not fit in the model, so a 20-tooth wheel is used, which gives effectively the same multiples of 2, 4, 5, and 10 per full turn of the handle. Dummy alternative dividing plates will be added representing a wide choice of other intervals. Not yet finalised, I look forward to the final design, and a demonstration of the dividing head. 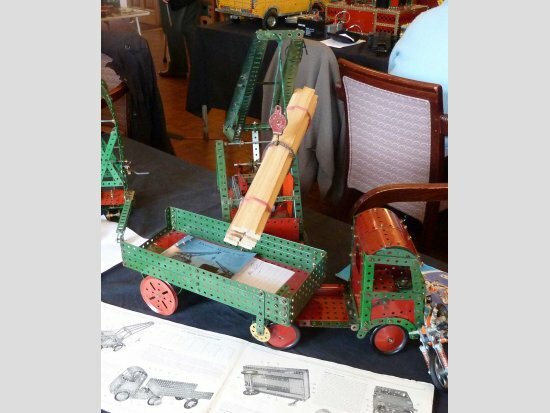 Next to Chris, John Palmer showed a neatly modelled version of the mobile crane SML7.15 placing a load in an articulated lorry(6.12) from the 1950’s manual. Mark Rolston showed the ‘Peterbuilt’ 10 wheel American tractor unit ( also seen at Skegness I believe when I didn’t have chance to take photographs so I am pleased Mark showed it at Baginton). 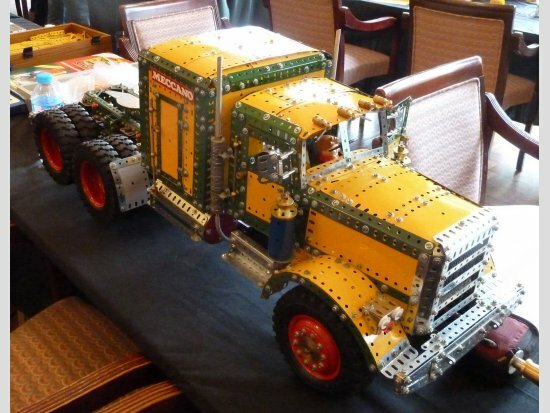 Based on the model by Joseph Attard, featured in CQ (2007), it includes working gearbox and clutch, reduction pinion differential units on the rear wheels and a sixth wheel to lock onto the trailer unit. 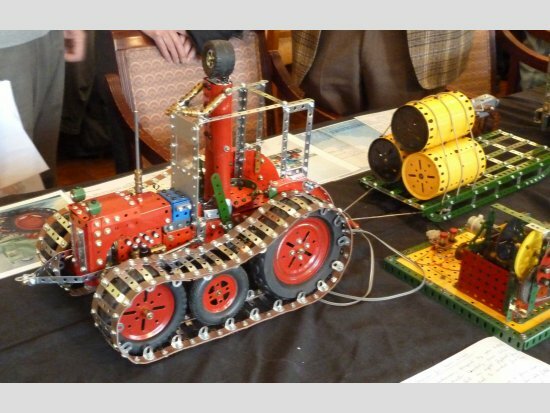 Colin Reid continues his research into the development of the early Meccano steam engines displaying a variety of vertical model steam engines by Meccano, Bing, mamod and Marklin and demonstrating that the 1914 Meccano version was a direct copy of the Bing engine. However a possible explanation is that Hornby, like other manufacturers (W.Bassett-Lowke) and other products e.g. the butter churn from Marklin, may well have brought in the Bing engine and simply badged it with the Meccano trade mark. This was not an uncommon practice before the 1914-18 war as German manufacturing was of high quality and much sought after in Britain. In the Wallace and Gromit film, The Wrong Trousers, a mechanical pair of trousers get taken over by master criminal Feathers Macraw. The Trousers are claimed to have been made by NASA for the use of astronauts. Tony's model is non powered (shame on you Tony - call for Gromit! ), and shows them with the control panel fitted before the hijack. The Soccomatic machine, also featured in The “spoof” Haynes manual “ Cracking Contraptions!” is fully operational. The book shows a wheeled box like vehicle on which is mounted a rotating four armed device on which are fixed football boots. A hopper on the top feeds a succession of footballs down a chute into the path of the rotating boots . A magazine holding twenty balls stored in five tubes containing four each, is fitted at the rear of the machine and can be swung down to feed more balls into the hopper. There is a seat to one side for Wallace . The angle at which the balls are delivered is altered by steering the whole machine left or right. The machine of course never existed as a working entity, all apparent movement was achieved by stop motion filming techniques. Tony tells about the challenges in making a working version. “The first problem was what to use as the boots. 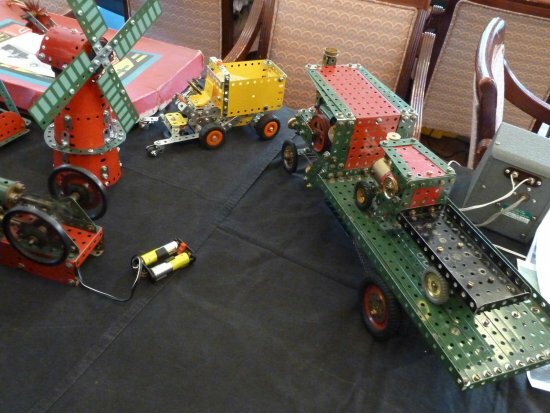 Several attempts were made to produce pure Meccano versions , but they all looked too clumsy. Then I recalled seeing cars driven by football supporters with pairs of miniature boots hanging in the windows. A quick trawl of Ebay found many for sale in all popular team colours. I bought two pairs with Aston Villa logos and found that they were perfect for the job. The scale of the model was set by the twelve inch high Wallace doll . The boots are slightly too big. 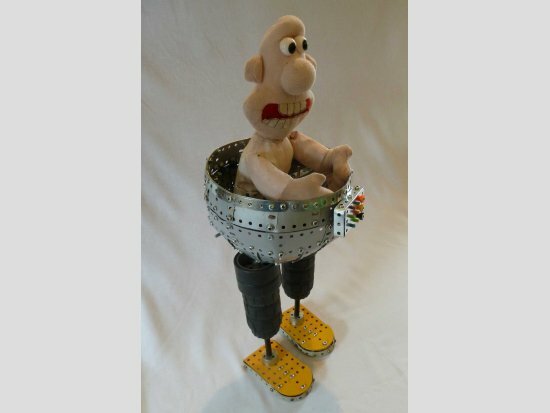 (I am sure Wallace doesn’t mind but Gromit might (Ed)). The rear wheels are independently mounted while the front wheels are fitted with Ackerman steering controlled by a lever in front of Wallace. The hopper is fabricated from small flexible plates and a hole in the bottom allows balls to roll into the delivery tube. A toggle mechanism operated from the driving position allows one ball at a time to drop into the delivery chute where they roll down to the ground. Four balls can be delivered before reloading. The boots are mounted on four arms and rotate at speed so that as a ball rolls in front it receives a powerful “kick” which sends it towards the goal. The angle at which the ball fires off is somewhat random depending on the exact moment at which a boot strikes it. 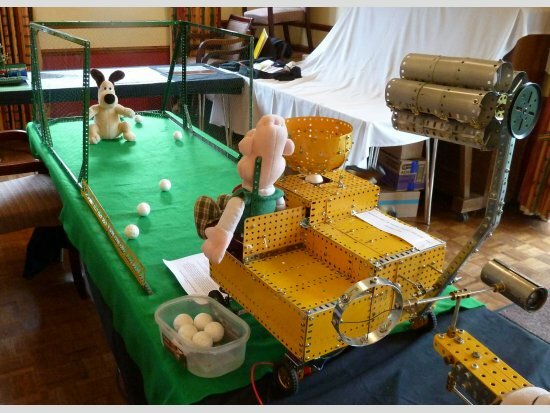 The boots are driven by a PDU.”(Great fun - even Gromit seemed to enjoy it! – Other contraptions will certainly follow and I leave them and Tony’s other models for another occasion- you can see them on the web). David Shirt, of the 30” reflecting telescope being built at the Hanwell Community Observatory (HCO) near Banbury. It is the largest telescope to have been built in Britain primarily for public use, and despite weighing 3 tons it can be pushed around by a little finger. 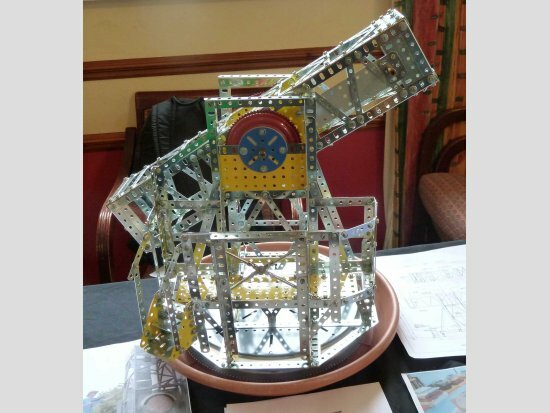 HCO members manning the stand at public astronomical shows decided photos and diagrams were inadequate to describe the telescope so David was asked to a make a Meccano model to demonstrate its function. The prototype rotates on a rail in a pit below ground level and after several experiments David used a GRB for the azimuth axis. The rest of the model is very close to the prototype, including two ball thrust bearings on the altitude axis. 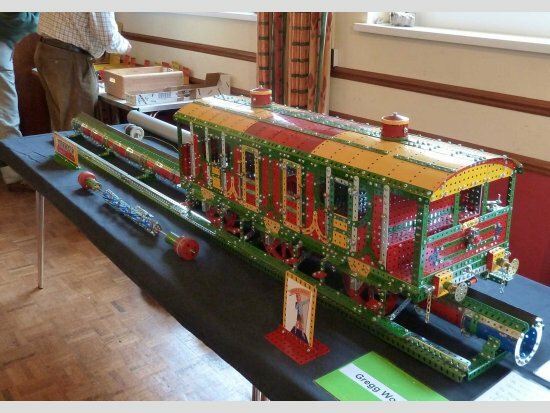 New member, Greg Worwood, has clearly been busy building, producing a large scale model of Brunel’s atmospheric railway. 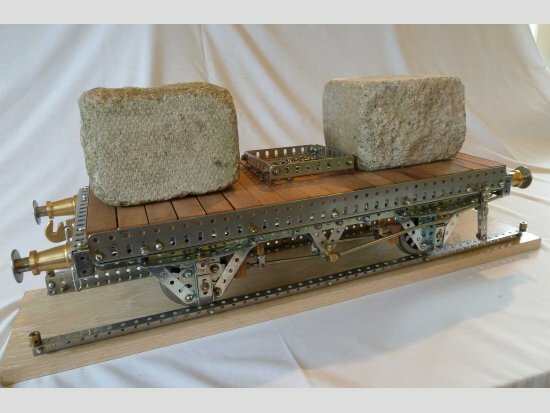 Built to a scale of 1:10 , the piston carriage is shown on a length of track (7’ ¼”) complete with vacuum pipe. Unlike Brunel’s prototype, which was abandoned in 1848 as unworkable, I believe Greg used the versatile ‘Henry’ vacuum cleaner to demo that the concept (at least on 1/10 scale model) does work . (Dyson eat your heart out!). Roger Auger showed 3 models including the rarely seen No.10 set Automatic snow loader in yellow and zinc livery. 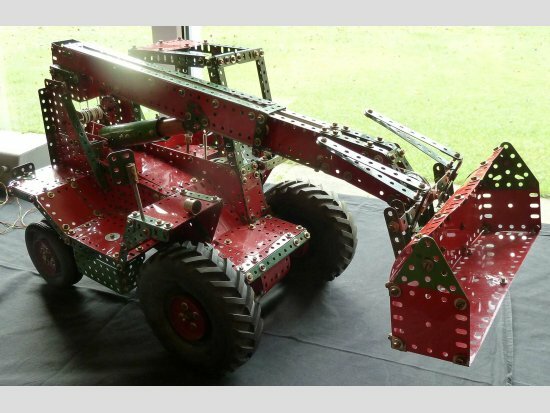 Roger had encountered the usual problems with manual models – requiring many rebuilds and redesigns due to the rear conveyer binding the drive mechanism. Roger also had a well presented No.6 set armoured scout car made with very much used (VMU) refurbished parts. 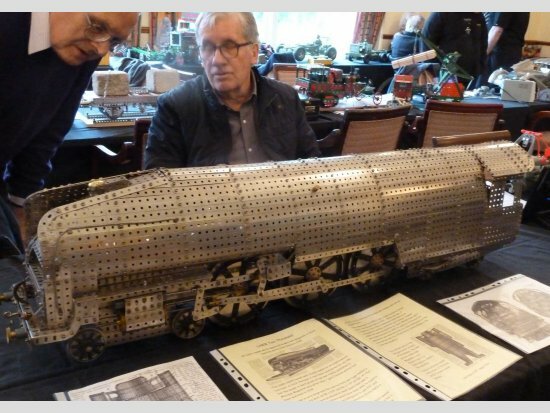 Phil Rhoades (no relation to Mike), also a new member , had an interesting collection of non Meccano construction sets including a Vogue build of the (horrid in my view!) 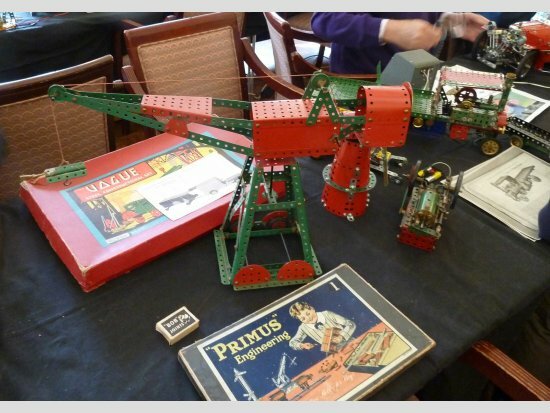 No5 Meccano manual crane , and a very attractive box for the Primus No.1 set. It was good to see John Bland again after his absence for a few meetings. 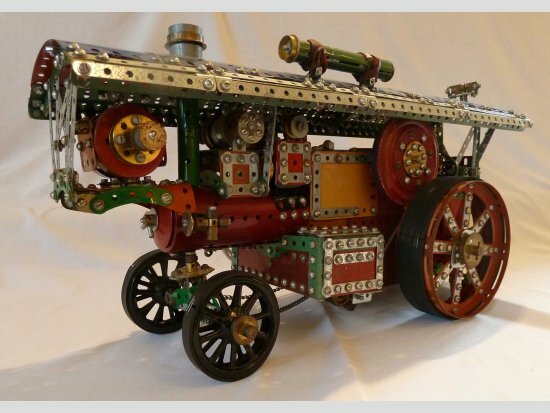 He had the well known 1928 steam wagon (model 4.60) carrying a smaller version to his own design. Sid Beckett had the Diesel Loco from the October 1953MM. 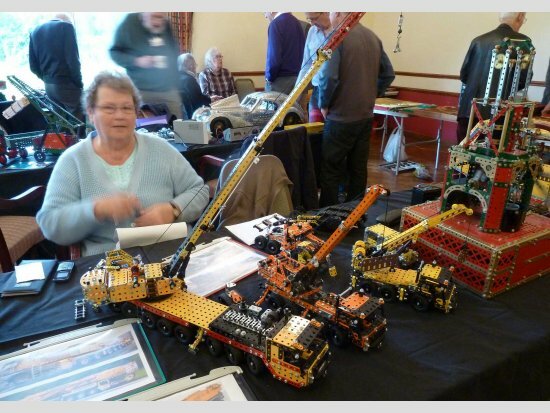 Paul Hubbard doesn’t like to waste time and gets on with building his models at our meetings, currently in process are large Dumper and a Coles Crane. Brian Edwards models are always a delight, full of detail and expertly puttogether with novel use of parts resulting in models that really do look like the real thing. At this meeting it was a Dennis Lancet used in 1933/34 , trailing a producer gas unit as used in the 1939-45 war. 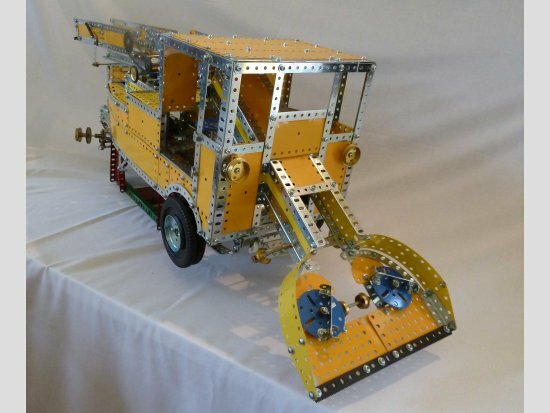 John Reid continues to develop the arctic exploration theme, this time a model based on the Ferguson TE20 tractors driven to the South Pole from the Ross Sea by Sir Edmund Hillary and his team in 1958 in support of the 1957/58 TransAntarctic Expedition. The petrol engined tractors were built in Coventry to the standard specification but modified for the Antarctic conditions. The actual vehicles had canvas coverings over the cockpit and rear engine area to protect the drivers from the harsh Antarctic conditions. The covering had no roof or back allowing the driver a rapid exit if the machine fell into a crevasse. In poor visibility, it also enabled him to stand on the seat and look out over the top of the canvas. He then steered the machine with his feet via extension rods on the differential brake pedals. There was no steering wheel. To enable the vehicle to be recovered from a crevasse, a front mounted A-frame was fitted just below the radiator. The rear half of the bonnet was removed to make the frequent refuelling easier – an eight gallon tank with, at worst, just over 1 mile/gallon. 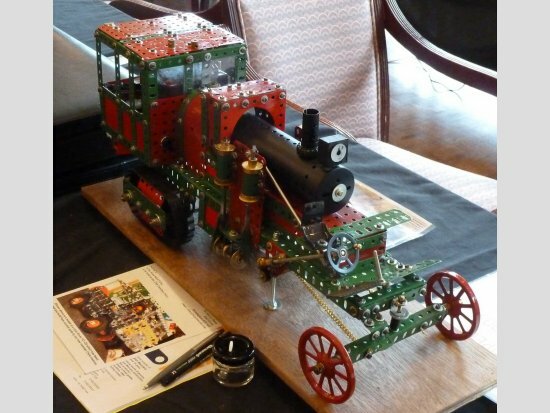 John always provides an attractive presentation of his models which are of unusual subjects very cleverly modelled. 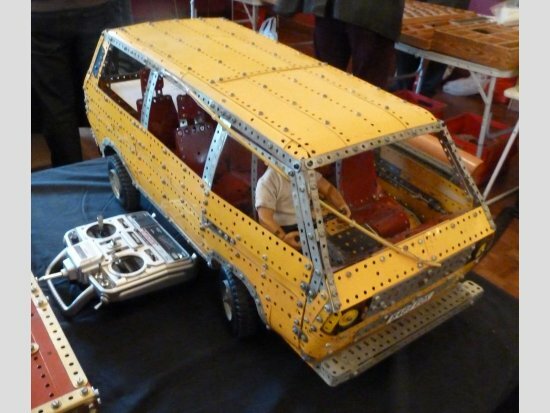 Geoff Devlin displayed a model from the modern ‘speed play’ Meccano sets and a mystery car built using only captive nuts. 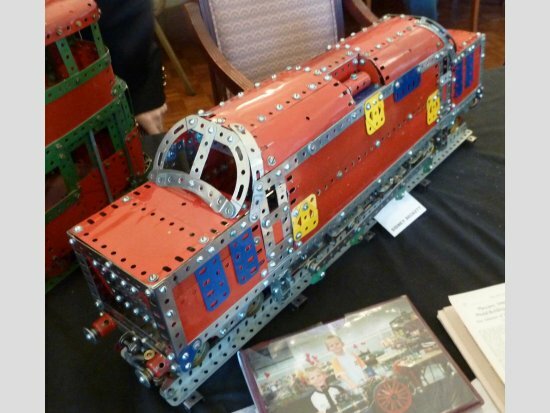 ‘Spinmaster’, now the owners of the ‘Meccano’ brand, are of the view that they need to attract younger children to buy Meccano and recognise that the dexterity to use bolts and nuts is clearly beyond youngsters- this may be realistic but in my view is a sad end to Hornby’s vision where even the cheapest and smallest sets still required the same dextrous approaches to construction. John Rodgers showed us his LNER10000 experimental ‘hush hush’ loco in resplendent nickel – I am amazed that so much nickel has survived in such good condition, clearly a testament to its quality. 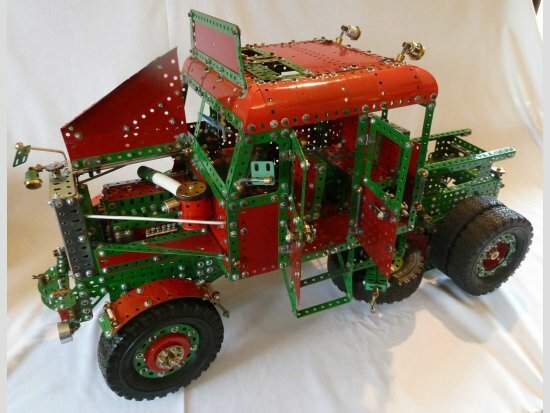 I fear that the modern Meccano will not be around in 100 years! Colin had brought a Liebherr 1500T telescopic mobile crane based on the Evolution set models but much developed to include triple axle front, and twin axle rear steering, stabiliser jacks and two section telescopic jib and fly jib using erector parts. The crane cab rotates 180 degrees from its travel position for crane operation. Colin also showed a Maudsley Table Engine from a model by David Whitmore which appeared in CQ in 1992, and which worked smoothly throughout the meeting. 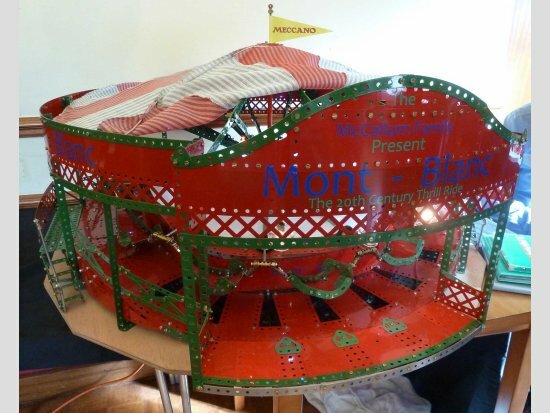 Tom McCallum showed his Mont Blanc fairground ‘waltzer’ seen at Skegness and pictured in the last bulletin. 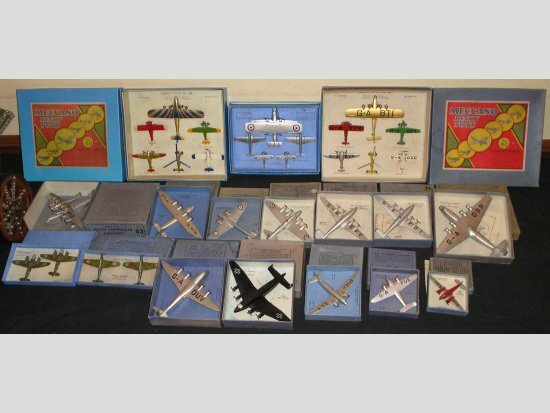 In the collectors corner Roy Whitehouse presented a fabulous collection of Dinky aircraft, all boxed, and combined with Richard Gilbert to present a display of pristine French Meccano sets 6, 7 and 8 from 1953-4 including accessory sets 7a and 8a. Dave Bradley showed his one sixth scale Volkswagon 1980’s T3 radio controlled ‘people carrier’ complete with driver and passengers. 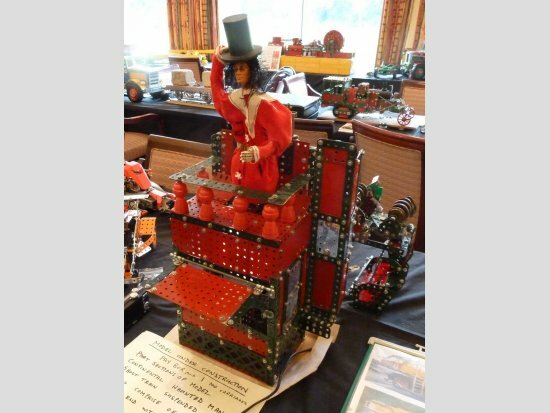 John Molden is constructing a new ‘fairground model’ and showed us the control/paybox for a ‘haunted mansion’ ghost train. This section shows a man who tips his head and top hat as the punters enter the roller coaster ride(yet to be built). is driven by a crane motor without casing which is sufficient to work the engine but not move the car, however this is to be modified to include a greater reduction ratio. Terry has supplied a more detailed description of the model which will be featured as a constructor project in future bulletins. It is not often that we have the company of three presidents of the guild: our current President Geoff Wright; also with us was Ken Wright, a much welcome past president who continues to show a great interest in the Guild, and brought along an evolution set crane truck; and in spirit if not in person, Ernie Chandler, one of the founder members of the guild, sadly no longer with us in body but present in spirit through his lovely Traction engine which he left to the guild. 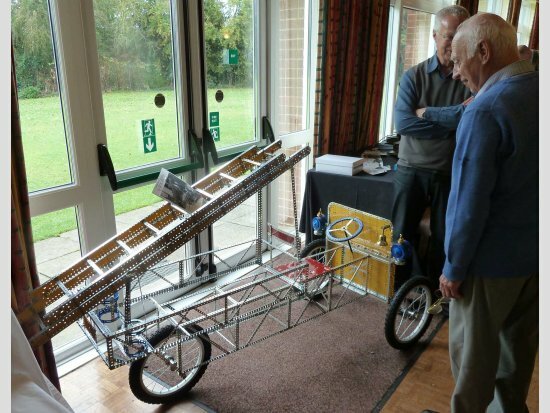 We are grateful to Tim Martin for offering to look after this model on behalf of the guild. Geoff Wright has now completed, all but the bonnet, his London Transport 'Interstation C'. 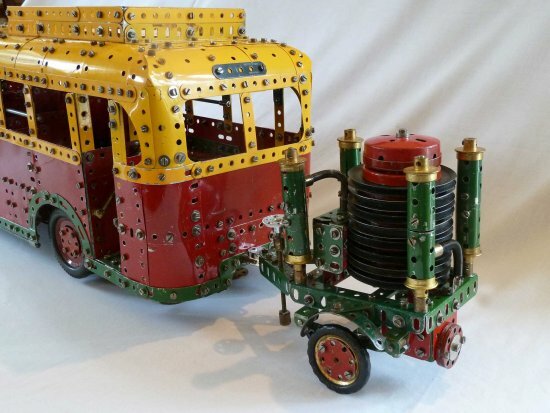 This bus, currently under construction, follows its predecessors in being made from the contents of a mid 1950s No.9 Outfit. Up to now, a scale of 1/16 full size has been followed. 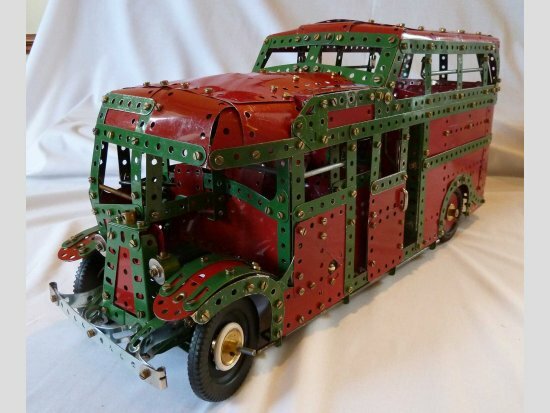 A benefit of this is that the resulting model of a 7’6” wide bus becomes the popular Meccano width of 5 ½”. However, this scale does give rise to some problems. It precludes the use of 2” Pulleys and Tyres which are somewhat overscale, forcing the use of the less attractive 187 Road Wheels; also as there are only four of these in the outfit, twin rear wheels are not possible. 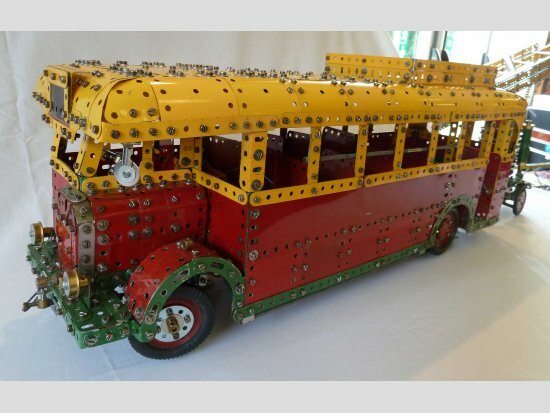 Previous models have been double deckers, very demanding of parts and so it has not been possible to fit them with seats. By choosing a much smaller prototype with fewer seats, this is now possible. Using 2 ½” wide plates as seats in 1/16 scale, however, results in centre gangways only ½“ wide. The decision was therefore made to make the model to 1/14 scale which gives a width of 6 ½” with a 1 ½” gangway and incidentally allows the use of 2” Pulleys and Tyres and double rears. Next came the choice of prototype. Leylands have always been favourite of mine, and their pre-war modestly sized ‘Cub’ suggested itself. However, a very fine model of this exists already, but I don’t recall seeing a model of its specialised companion which is the one I have chosen. In 1936, newly formed London Transport bought a unique fleet of eight ‘Cubs’ with Park Royal bodies incorporating a raised rear passenger deck over a large luggage compartment which operated a circular route linking London’s main line railway stations at a flat fare of 1/-. 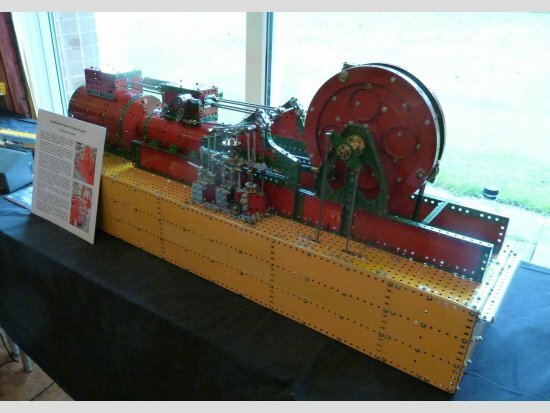 Having decided to include seats, a problem arose; I could not find a seating plan in any of my books, or on the internet, so initial construction of the model involved a deal of guesswork. I happened to mention my problem to a great friend in the bus publishing world (like me, a great enthusiast for Alexander’s buses) who possesses a vast file of information of buses of all sorts, and the next day a fully detailed scale drawing of the ‘Interstation C’ arrived in the post. So now I had all the information I needed – but – a lot of my construction so far was wrong – and much more detail than I had originally intended was now possible, so it was very much a case of back to the drawing board! As the model is far from finished, I have decided to exhibit it as ‘work in progress’. I have particularly enjoyed scheming out the sliding door with grab handle, and the rear luggage compartment doors with working catches.